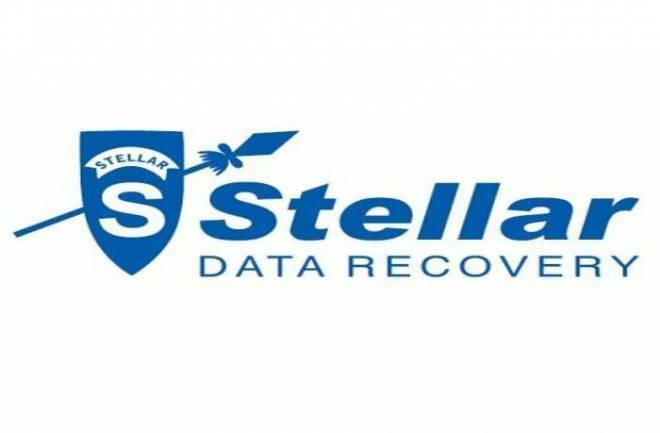 Review : Stellar Data Recovery a perfect tool for your data recovery needs! Safely storing data has been one of the biggest challenges since the inception of mankind. Well, not literally but it has been a big issue since we started depending on Computers and laptops to store our important files and precious memories. 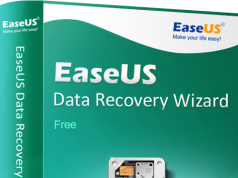 Being a person who has accidentally deleted a lot of data in the past, I have tried many recovery softwares and there’s one that stands out. Our mission is to maximize the chances of successful data recovery and achieve total customer satisfaction by delivering data recovery and safety through quality products, services and solutions. Started in 1993, Stellar Information Pvt. 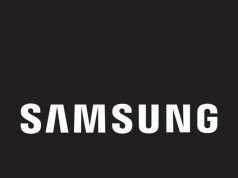 Ltd. was founded by Sunil Chandna, Manoj Dhingra and Kuljeet Singh with HQ at Gurgaon, India. The company started with a unique idea of Data Recovery which was very less heard of in 1993. But today, it is empowering 2 Billion+ Customers around the world with their outstanding services in Data Recovery field. Before moving forward, let’s introduce our test setup for this review. We have used a HP Pavilion laptop powered by 6th-gen Intel i5 processor, 8 GB RAM, and 1 TB HDD. We will be trying to recover all the files I deleted from this laptop over the course of 6 months. Stellar follows a minimal interface with all the options displayed directly on the start screen. 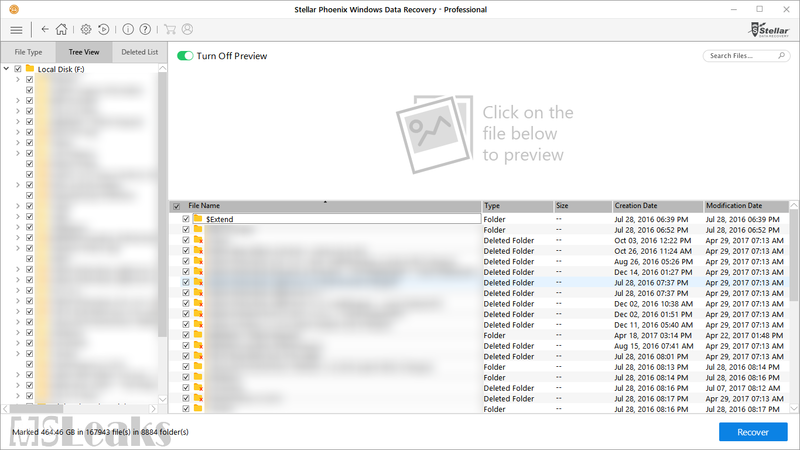 The start screen asks you to select which type of files you want to recover which is a really good option since you don’t want to be scrolling through thousands of files which might be useless for you. You can select files like Emails, Folders, Audio, Video, etc. which will instruct the software to look for the defined file types. Minimal design is what makes Stellar stand out from others. As you proceed forward, you will get the drive selection option which is again laid out pretty well. It will ask you to select the drives where you want to run the scan. In case you don’t find the files you were looking for, you can also head to the left corner and select deep scan. This option will be available at the bottom once the scan finishes so you can do a deep scan in case you don’t find what you were looking for. You can also save the finished scan so in case you want the results later on for restoring files. 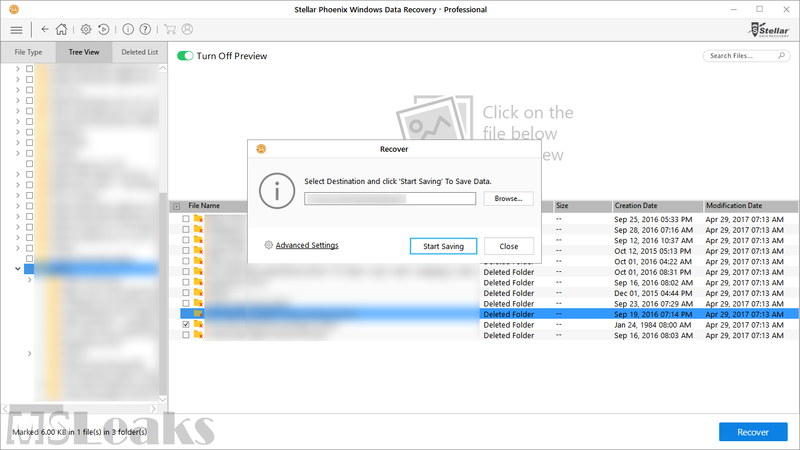 On the list, you can simply select the files you want to recover and then hit the recover button. This will start the recovering process once you select the location to save the files restored. On this dialog, you can also select advanced options and choose extra settings you might want for the file to be saved. Once you hit Start Saving, it will start recovering the files. Bottom line: We really loved the interface of the software. The design is clean and easy to understand for everyone. Any person can easily use it by following the on-screen instructions. This is one of the biggest aspects of these softwares is the performance and how fast it can get you the right results. 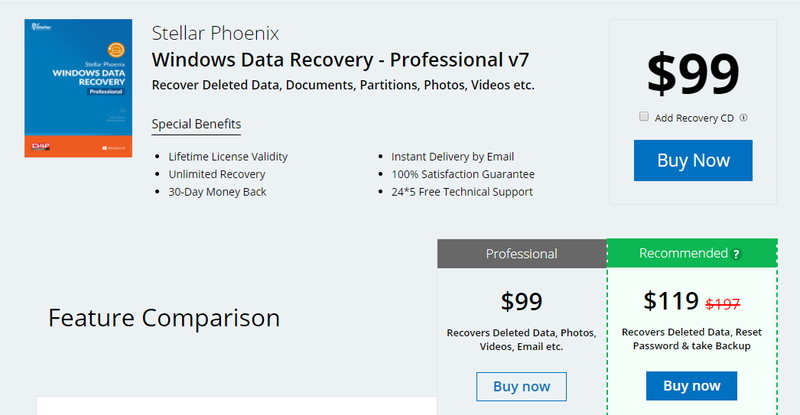 We were blown away by the amazing performance of this software I was personally surprised to see the speed at which it scanned my 500 GB partition and gave me the list of files that were deleted. The recovering time was a little slow as compared to the speed at which it gave the list of files deleted. We tried restoring back a couple of movies I deleted sometime back and the total size of the files was around 4.5 GB. The software took around 25 minutes to recover back all the files. Bottom Line: We loved the speed at which the software was able to detect the deleted files but we think there’s room for improvement in terms of recovering data. When it comes to pricing, according to a page on Steller’s website provides 2 options. One is Single User which will cost you $99 which is not too costly since it helps you to make sure that your precious files are not lost forever. The other option is the Bundle Option which costs $119. Apart from these, there’s also a Free version of the software but you have to pay if you want to recover the files since the free version only lists out the deleted files. You can get the software from their Official Site Here. We recommend the software to everyone who keeps important files on their Laptops or Computers. Steller is a neat tool with a clean interface which will make you fall in love with the software. We really loved the way it is designed and it is completely compatible with latest Windows 10 OS which is a bonus. As we noted earlier, it is a little slow in recovering back files but it is better to wait an hour rather than lose all the important data forever. 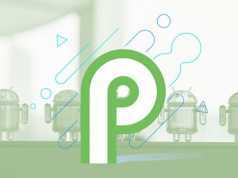 Next articleLeak : Google Pixel 2 live photos!